I was super excited to find McVities Digestive Biscuits at a local store. Now I could make this no-bake English treat with the authentic ingredient. Tiffin is a chocolate confection filled with nuts, dried fruit and broken bits of cookie. 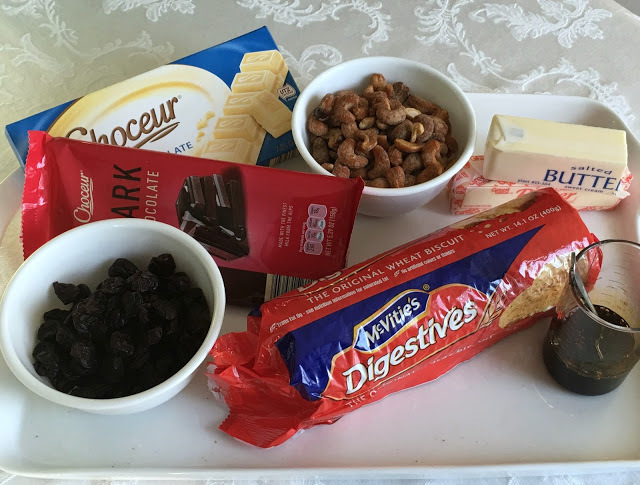 Fold in the hazelnuts, McVITIE’S DIGESTIVES© and figs. Spoon the mixture into the prepared tin and press it down firmly to remove any air bubbles. 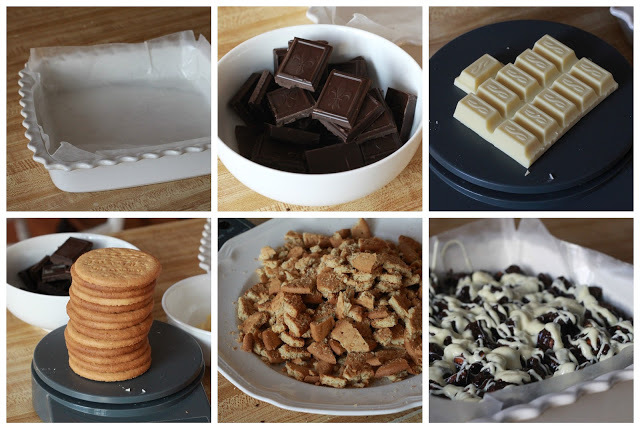 Melt the white chocolate in a glass bowl over a pan of simmering water. 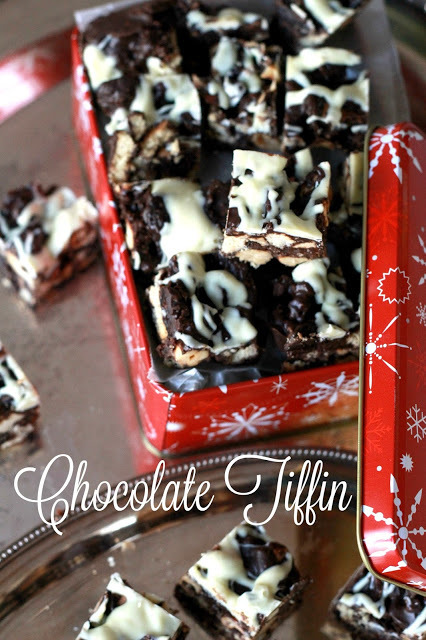 Drizzle it over the tiffin with a teaspoon in lines and use a cocktail stick to drag the chocolate lines in a backwards and forwards motion across the whole tiffin. Leave in the fridge to set before serving. * I miss calculated the amount of butter when preparing, using 7/8 of a stick rather than 7/8 of a cup of butter. 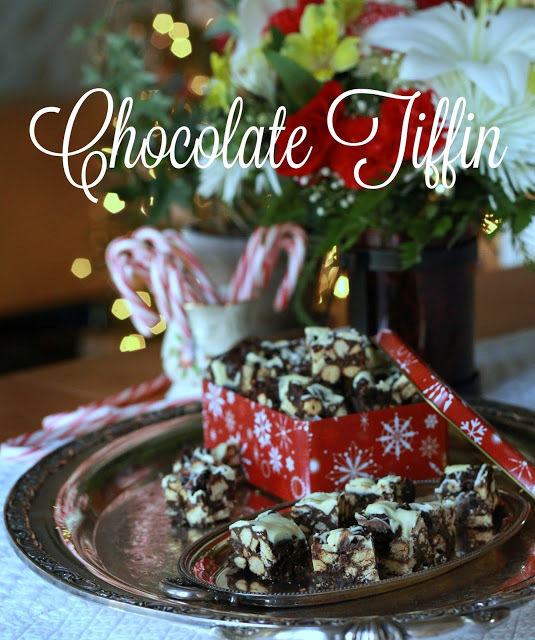 Though I saved a bunch of fat and calories and the tiffin tasted wonderful, it was a little crumbly and it would had make a prettier confection with the additional butter. Feel free to substitute your favorite nut and dried fruit for the hazelnuts and figs. Other recipes suggest using graham crackers if you can’t find McVities Digestives. I have substituted vanilla wafer cookies with success. 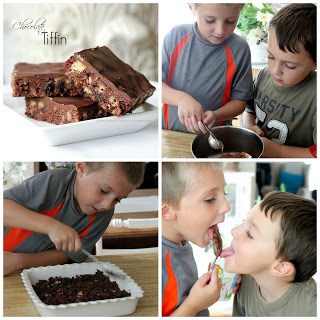 Here is the link to another yummy tiffin recipe I made with my grandsons a few years back. I've never heard of this either but it sounds easy and fun! Sounds delicious. I had never heard of McVities Digestives until a little while ago when I was reading a book and they were mentioned in there. Then I read your blog post and read about them again. Good Morning! I am not familiar with this treat but it looks delicious and easy. Like you, I would like the substitution of dried cherries and cashews. Merry Christmas dear friend.